DMK president M Karunanidhi is stable and continues to be treated at the ICU of a hospital here for the third consecutive day as Tamil Nadu Chief Minister K Palaniswami and his deputy O Panneerselvam visited the hospital to enquire about the leader's health. Palaniswami after visiting Karunanidhi at Kauvery Hospital told reporters that the DMK chief's health condition is "stable...he is well...a medical team is attending on him... Me and deputy chief minister O Panneerselvam along with DMK party working president M K Stalin and Rajya Sabha MP Kanimozhi visited him in person." 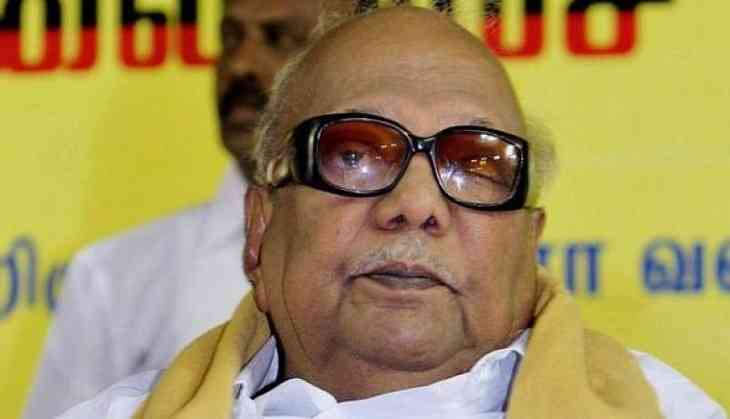 Last night, a medical bulletin issued by Kauvery Hospital said: "There was a transient setback in the clinical condition of DMK president M Karunanidhi. With active medical support his vital signs are normalising. He continues to be closely monitored and treated by the panel of expert doctors,"
On July 18, he had underwent a procedure at the same hospital for replacement of a tracheostomy tube to help him breathe normally.